From an article by Captain Caesar F. Fiore, Cavalry as published in the Cavalry Journal, March April 1942. Instead of the 2 ½-ton truck being used as the maintenance truck we consider it as a supply truck to carry spare parts and sub-assemblies. In addition, the supply truck can serve as a wrecker, car shop and general refueling station. The maintenance vehicle instead of being the 2 ½’-ton truck is the ¼-ton 4 x 4 outfitted and equipped to do first, second and limited third echelon repairs on any vehicle in the organization. The small sturdy and highly manuverable vehicle outfitted and equipped with cabinet and tools as shown in the accompanying photographs can do almost all of the work that has been done by the 2 ½-ton truck. The limit of effectiveness is not dependent upon the size of the maintenance vehicle but rather by the nature of the repair and the availability of replacement parts. a. 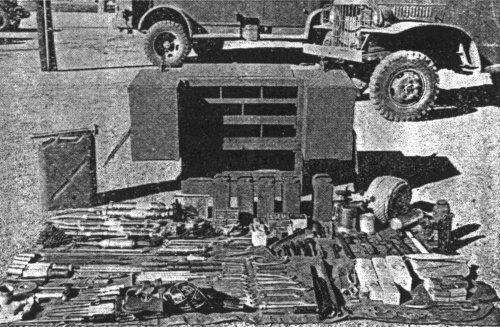 One 2 ½-ton truck, with boom and winch, well stocked with replacement parts. This truck does rear line maintenance and towing only. It serves as a mother vehicle to carry the supplies that the smaller ¼-ton trucks will need for the actual front-line maintenance. b.Two or perhaps three ¼-ton 4 x 4 trucks outfitted with equipment as shown in accompanying photographs. 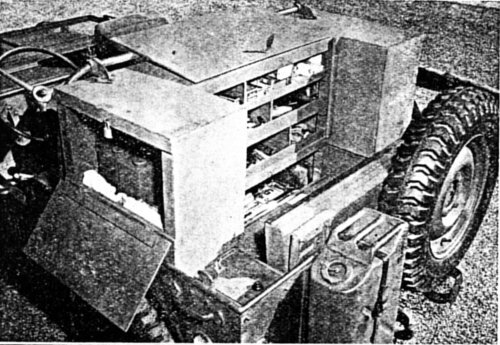 c. A combat vehicle, either scout car or tank equipped with radio to receive calls from disabled vehicles. This vehicle xviii also serve to protect the maintenance section against local attacks. To give an example of how this arrangement works let us assume that a reconnaissance troop is on a mission well forward of other divisional units and in the vicinity of enemy forces. The third platoon covering the right sector has a failure in one of its vehicles, let us say a burned out coil. 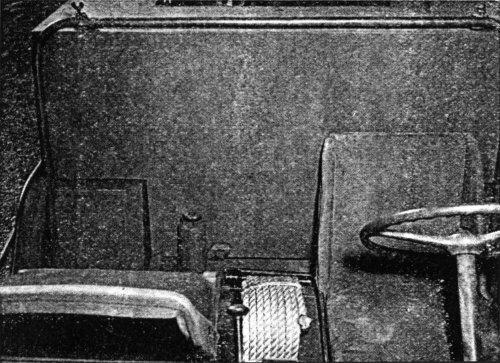 By pre-arranged code symbols the third platoon commander radios troop headquarters “one scout car disabled,” giving the nature of the trouble and the location of the vehicle. In most cases the maintenance section radio will pick up the message direct. But in the case they do not, Troop Headquarters will send them the message. Immediately one of the Maintenance Peeps gathers the required replacement parts and races off to the scene. Using its high road and cross-country mobility, it covers the distance rapidly. If the damaged Scout Car is so situated as to cause difficulty in location, guides are sent out from the disabled vehicle to assist the Peep in arriving at its destination. Once the Peep has arrived at the scene, it is only a matter of moments until the damaged combat vehicle is repaired and has again taken its proper place in action. The Peep returns to the maintenance section and awaits new missions. In this manner the great majority of motor failures can be reduced in the minimum of time and without unnecessarily exposing more expensive equipment. It can be readily seen that the result will be increased speed in reconnaissance; and where time is the watch word “Blitz Maintenance” must be exploited to the fullest degree. In photograph No. 3 a display of all tools and equipment carried in the cabinet is shown. It is not necessary to list here all the parts and tools shown. The weight of the cabinet and all items shown complete is appromately 320 pounds. This is not an excessive load for the ¼-ton 4 x 4 vehicle.